ZetaTalk accuracy on their predictions has been a hallmark feature of ZetaTalk since it began in 1995. With the creeping announcement admitting the near presence of Nibiru, any in the establishment trying to refute ZetaTalk predictions will be faced with trying to explain how the Earth changes keep unfolding as the Zetas predicted. Thus, ZetaTalk by proxy has emerged, where ZetaTalk predictions are made by various scientists, who then claim them, so that when the Earth changes occur these scientists can claim they, not the Zetas, were right. This trend first emerged during the recent quakes in Southern Japan at Kumamoto in April, which the Zetas described as the 7 of 10 plate movements restarting. Taking a page from the ZetaTalk description of the 7 of 10 quakes, a US seismologist jumped in to predict “at least four earthquakes greater than 8.0 in magnitude”. Of course, the Zetas predicted several magnitude 8 quakes in Japan that would lead into the New Madrid quakes, which are likewise expected to be magnitude 8. The US seismologist was not required to explain his prediction. Why is the crust of the Earth shaking so violently all of a sudden? Over the past 48 hours, there have been five major earthquakes globally, and one prominent seismologist has declared that “catastrophic mega earthquakes” could be on the way. In fact, seismologist Roger Bilham of the University of Colorado has made headlines all over the world by warning that “current conditions might trigger at least four earthquakes greater than 8.0 in magnitude”. ZetaTalk Prediction 6/19/2010: So what would constitute large earthquakes sufficient to be a herald for the New Madrid adjustment? We are speaking here of quakes with a magnitude of 8 or higher, truly in the scale of a 9 but perhaps not called that because of the USGS cover-up on quake magnitude. These quakes will rival the large quakes that Japan has historically suffered periodically, but will be characterized by sympathetic adjustments in the Pacific Ring of Fire not normally accompanying large Japan quakes. The whole region will be seen as under pressure from subducting Pacific plates and the reaction to this pressure. Using a human scientist to lay claim to a ZetaTalk prediction was also recently done re the daily Earth wobble, which forms a Figure 8 when viewed from over the N Pole. Never mind that it has been apparent since 2004, and tracked regularly by ZetaTalk fans. Ah, Global Warming to the rescue! The Arctic has been freed of ice, while the Antarctic is gaining ice, and somehow this is all the fault of Global Warming, causing the top part of the globe to wobble about like a top that has lost its balance. Stepping in just before the daily wobble gets so bad that it becomes the topic of discussion around morning breakfast tables, scientists can now claim they predicted it! Global warming is changing the way the Earth wobbles on its polar axis, a new Nasa study has found. Melting ice sheets, especially in Greenland, are changing the distribution of weight on Earth. And that has caused both the North Pole and the wobble, which is called polar motion, to change course, according to a study published on Friday in the journal Science Advances. Moving along to May, more ZetaTalk by Proxy emerged. The Zetas have long predicted that the SE United States would lose 150 feet in elevation during the hour of the Pole Shift, and that this pulling down of the East Coast of the US would be a steady process as the Atlantic pulled apart well prior to the Pole Shift. Global Warming is being blamed for rising seas worldwide, but how to explain to those living along the East Coast how they are experiencing inundation when this is not happening elsewhere? The establishment has emerged with a bizarre explanation – magma fragmenting. 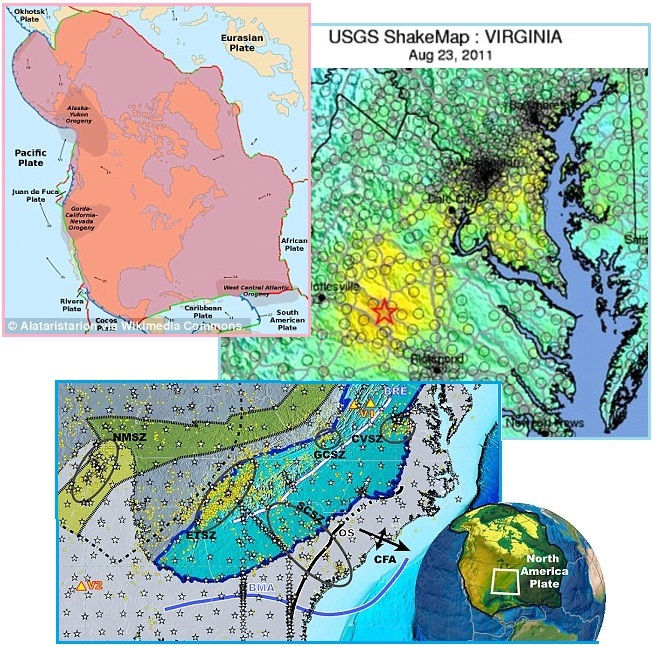 The southeastern United States has been hit by a series of strange unexplained quakes - most recently, the 2011 magnitude-5.8 earthquake near Mineral, Virginia that shook the nation's capital. Researchers have been baffled, believing the areas should be relatively quiet in terms of seismic activity, as it is located in the interior of the North American Plate, far away from plate boundaries where earthquakes usually occur. Now, they believe the quakes could be caused by pieces of the Earth's mantle breaking off and sinking into the planet. A new study found pieces of the mantle under this region have been periodically breaking off and sinking down into the Earth. This thins and weakens the remaining plate, making it more prone to slipping that causes earthquakes. ZetaTalk Prediction 7/2010: The land will drop in sea level, during the shift, 150 feet. The East Coast of the US south of the New England area will suffer during the pole shift, due to this general stretching that the plates under the Atlantic during the crustal tension ahead of the shift. With the crust resisting a ripping apart so that the land on the edges of the Atlantic Ocean are pulled down. ZetaTalk Prediction 7/2010: Florida will lose 150 feet in elevation overall due to the pole shift, but not more than a couple feet prior to the pole shift itself and only inches prior to the week of stopped rotation. When the Atlantic stretches, just prior to the shift, the lands closest to the equator will feel the draw the most, as this is where the Atlantic rifts are deepest. Thus, where land in the southeastern US will be pulled under to the degree that water may lap at cities high in the Appalachian mountains, along the eastern seaboard, it will surely pull Florida under the water long enough to drown the populace totally. ZetaTalk Prediction 7/2010: Low lying lands along the eastern coast of the United States will be drawn below sea level some 150 feet at the start of the pole shift, water rushing in over land pulled down temporarily by the stretch that the sea floor of the Atlantic will experience. This in combination with the tidal waves that all ocean coasts can expect will wreak havoc on states such as Georgia. Where Georgia has land in it's headlands that border the Appalachian Mountains, the steady rise of land from coast to foothills will actually encourage the water to rise higher, as it will gain momentum. 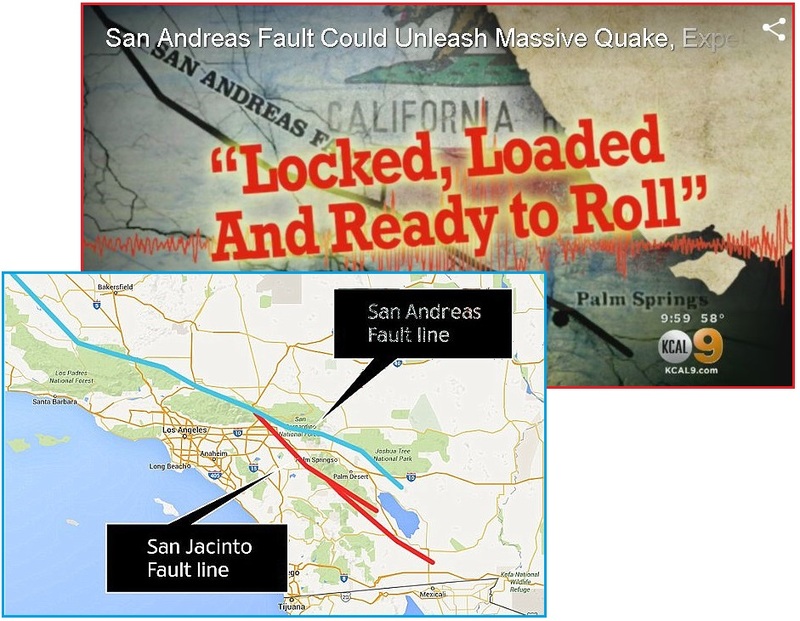 Almost simultaneous with the May 4 magma fragmenting article explaining why the SE United States would start to experience sinking, came a warning about the San Andreas being “locked and loaded”. Apparently, the reason for this warning is that the fault has been “too quiet” since 1857. So why the warnings now? Note the repeated references to the 1811-1812 time frame, when the New Madrid last adjusted. The establishment is building a subconscious relationship between quakes along the New Madrid and anticipation of major quakes along the San Andreas. ZetaTalk has predicted that the West Coast will follow the New Madrid adjustment, with major quakes, though moderate quakes will be experienced in both regions as this drama unfolds. Since describing the N American Plate in a bow stress would be difficult without an honest discussion about Nibiru and ZetaTalk and the 7 of 10 sequence, they are just issuing warnings without giving the background justification for their warnings. The San Andreas has been asleep since 1857 but we just decided to issue warnings in the headlines. Humm. Californians are being told to brace for 'the big one' - a massive earthquake that typically occurs every 400 to 600 years and could leave thousands dead or homeless. An earthquake scientist has added to claims the dreaded event is overdue, warning the San Andreas fault is 'locked, loaded and ready to roll'. The fault is the longest in California and one of the state's most dangerous. Thomas Jordan, director of the Southern California Earthquake Centre, said the fault has been 'too quiet' since 1857. This is when the last big quake to strike a southern section rippled from Monterey County to the San Gabriel Mountains near Los Angeles with a magnitude of 7.9 on the Richter scale. In San Bernardino County, the fault hasn't moved much since an earthquake in 1812. Evidence uncovered by the expert suggests the terrifying scenario occurred in 1812, devastating the region between San Diego and San Buenvaventura. The warning for Southern California was revealed during the National Earthquake Conference, which was being held in Long Beach and has drawn scientists from all over the world. ZetaTalk Prediction 2/10/2006: The giant plates of N America and Eurasia are locked against each other, unable to rotate against each other due to their shape. Slip-slide along the West Coast, measured as a creep by geologists, is due only to slight adjustments along that edge of the plate, primarily due to adjustments within the small plates to the west of the N American plate, which move to accommodate pressure. The N American plate does not move, pre se, but other dramas occur. New England is pulled to the east while Mexico is pulled to the West, so the New Madrid is put under slip-slide stress where one half, east of the Mississippi, will move toward the NE while the other, west of the Mississippi, moves toward the SW. There is pressure along the West Coast, of course, and as the N American plate confronts the compressing Pacific, this will only result in the predictable volcanic increases and West Coast earthquakes. But the primary drama preceding the pole shift will be the ripping action that a plate unable to move must endure. The notable area of catastrophe during this is the eastern half of the continental US. From Houston to Chicago to New England, the diagonal pull will tear the underpinning of cities and create a catastrophe for the US that will make the New Orleans disaster appear trivial. ZetaTalk Prediction 10/16/2010: Where the N American continent is under great stress, it has not slipped because it is held in place on both sides. When the Japan adjustments are made, there is less holding the N American continent in place than before, and the New Madrid gives way. ZetaTalk Prediction 8/28/2010: We have warned that quakes on the West Coast, or the Seaway, or in the New Madrid region will occur before the major quake in the New Madrid region we have referred to as the adjustment on a 7 of 10 level. There will be quakes in these areas, magnitude 4-7, which should not be considered the New Madrid adjustment of which we speak. We have described a series of large quakes, with one major one stemming from the New Madrid area that will be called a magnitude 9 but in truth will be larger. It is this quake that will set in motion adjustments elsewhere. Mexico will lurch to the west as this major quake occurs, with a settling of land to the west of the Mississippi almost instantly afterwards. Also appearing on May 6 in Season 11 of the Ancient Aliens series was a show on Antarctic, featuring Annunaki pyramids under the Antarctic ice, the mammoth found flash frozen in Siberia, then shifting to sudden and unexpected climate change, the Pries Reis map showing an Antarctic free of ice, a 12,000 estimate for the last “ice age”, and shifts in accordance with Hapgood’s theory. It was suggest that a comet impact created the crustal shift, and also presented a number of unsubstantiated theories such as Antarctica being the site of Atlantis in the past, and a NAZI base in Antarctica. Crustal shifts of course are a Hapgood theory, and that Antarctica was once tropical land is documented by Velikovsky. The Annunaki pyramids appearing worldwide also are nothing new, nor is evidence of the Annunaki traveling the globe from Egypt to Central America to Easter Island and elsewhere. But what is unusual is mention of the Earth’s North and South Poles having been in different locations a mere 12,000 years ago, and the emphasis on a crust shift. The public is being awakened to these concepts, and the Zetas have from the start of the ZetaTalk saga described the Pole Shift as a crustal shift. Antarctica is Earth's most remote and least explored continent. 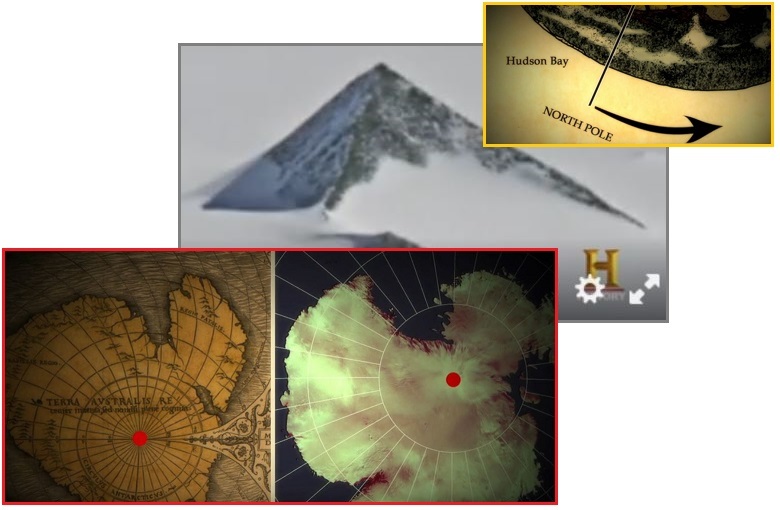 It is buried under as much as three miles of ice in some places, but recent satellite imagery has revealed what appear to be the tops of man-made pyramids scattered throughout the ice-covered landscape. But how is that possible? Ancient Astronaut theorists suggest that an ice-free Antarctica may have been colonized by extraterrestrials in the remote past, until a global catastrophe plunged it into the ice age. Is there a greater history on the continent than what mainstream scholars suggest? Scientists have reported strange magnetic anomalies radiating from beneath the ice, the Nazis allegedly made secret expeditions to the continent in search of a lost civilization, and government whistleblowers have come forward with claims of strange sightings. Perhaps hidden beneath the ice of this frozen continent lies the truth about our extraterrestrial origins. ZetaTalk Prediction 7/15/1995: The pole shift is therefore sudden, taking place in what seems to be minutes to humans involved in the drama, but which actually takes place during the better part of an hour. There are stages, between which the human spectators, in shock, are numb. At first there is a vibration of sorts, a jiggling, as the crust separates in various places from the core. Then there is a slide, where the crust is dragged, over minutes, to a new location, along with the core. During the slide, tidal waves move over the Earth along the coast lines, as the water is not attached and can move independently. The water tends to stay where it is, the crust moving under it, essentially. When the core finds itself aligned, it churns about somewhat, settling, but the crust, more solid and in motion, proceeds on. This is in fact where mountain building and massive earthquakes occur, just as car crashes do their damage on the point of impact, when motion must stop. China constructed Ghost Cities which are inland and away from the coastlines, and Russia is developing its Far East to absorb its populous western sections near Moscow and the Urals when the Aftertime flooding makes this necessary. What does the US have? The US has an Executive Order, which encourages the development of rural areas, but nothing beyond this. ZetaTalk Analysis 5/14/2016: China has had their ghost cities built and ready for occupancy for over a decade, and Russia is not only developing its Far East but moving its population there steadily. All this in preparation for the Aftertime flooding, which we the Zetas have predicted, which will raise the sea level along the coastlines to 675 feet above the present level. The US, and Europe, have made no such moves, seemingly waiting for disaster to strike before making arrangements for their displaced citizenry. The elite in the US and Europe have long been making arrangements for themselves. But what of the common man? Obama issued Executive Order 13575 in June 9, 2011 which allows the federal government to get involved in developing rural areas. This presumably would support constructing barracks and forcing starving citizens to farm, to feed themselves, but makes no allowance for those citizens who are in the upper middle class - neither poor nor in the 1% - and who can purchase better accommodations for themselves. The servant class can farm, but they expect to be above that, acting as technocrats or management. Europe is apparently expecting their citizens to rush to Norway and Sweden or into the Alps, with the elite such as the Queen deserting Europe altogether. This void in the western world opens the door for opportunistic corporate development, to provide survival villages for those who are either wealthy or well off, the 1% and the upper middle class, inclusively. 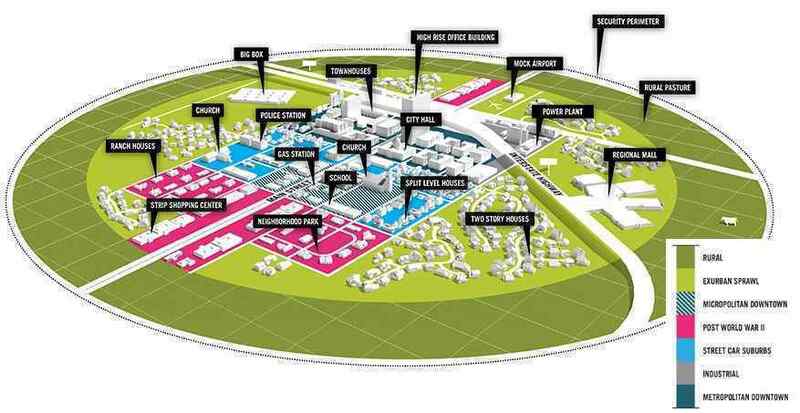 In the New Mexico desert, a billion dollars is being poured into building a futuristic city, with green energy powering the buildings and self-driving cars navigating the streets. The Center for Innovation, Testing, and Evaluation (CITE) is set to be built near Deming, New Mexico, about 30 miles north of the Mexican border. It will act as something of an experiment in urban planning. Barren desert will give way to tree-lined streets, with schools, high-rises and suburbs meant for a population of 35,000 that will never actually live there. Renewable energy sources – such as solar, wind, geothermal and even biopower plants – will run side-by-side with new forms of water treatment and cyber-security projects. ZetaTalk Analysis 5/14/2016: The CITE lab is designed to not only explore the feasibility of such cities for the upper middle class in the US, but to actually build them in anticipation of filling them in the near future after disasters. Cities and suburbs will be destroyed along the New Madrid and the San Andreas, but those with healthy bank accounts or assets that can be liquidated will move into these survival cities. Yes, they will be self-sufficient, by design, and there will be barracks for the worker class who will farm and clean for their masters. 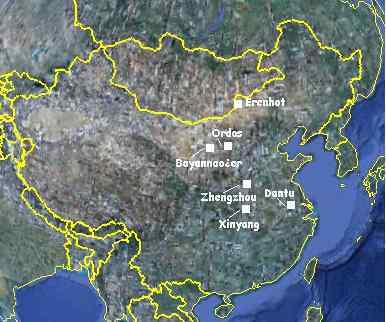 China has its ghost cities, and the US will have its CITE enclaves. This is the plan. The Zetas have long advised that the common man be leery of offers for a safe haven. They predicted that the elite would be forced from their underground bunkers, due to safety concerns, and would need to grow food to survive when supplies ran out. Thus cities such as the CITE cities being developed. Slave camps will be formed, giving a home to the desperate, the homeless and hungry, those who have lost everything during earthquakes and floods. Free housing and work, will be the offer from their new slave masters, and in the Aftertime the new slaves will find they cannot leave, cannot escape, and the concept of civil rights or a US Constitution guaranteeing freedom does not exist anymore. No one will rescue them, and no one will be watching either, the new laws being laid down by the new masters. The new CITE cities being formed have that signature - a slave city for the worker class, perimeter security keeping the workers in as well as intruders out. ZetaTalk Warning 1/10/2004: Bunkering into mountains has been a favorite theme since the days of Mt. Weather, only the barest revelation of a massive undertaking to go underground, from Denver to Houston to Kokomo to Virginia, known to the public. As the Earth changes have commenced, the lock-down of plates during the deep quake that peaked in the 80’s and early 90’s, the move to domino quakes where the whole world felt the shutter of an adjustment anywhere on its surface, and the devastating effect of stretching, not even considered in prior calculations. The term ‘rock solid’ takes on grim overtones when this is rock that drops into the tunnels during stretching, or shifts to skew a doorway such that it cannot be opened. It is known that when rock is compressed radio static and compass interference occur, but those in underground chambers die mysteriously during intense rock compression, a surprise to their human masters who suddenly find themselves making other plans at this late hour. ZetaTalk Warning 10/15/2001: Sensing that troubled times are soon at hand, many strongly in the Service-to-Self will attempt to line up a soft life for themselves, where they can be in control of others and dictate the daily events. This takes the form of attempts at leadership, and offering a safe haven to desperate people unable to do anything but grab a life-line. These safe havens, of course, will be anything but that, and are in essence slavery and abuse. Such offers, to the public at large or to selected groups recently made desperate by disasters in their communities, take the form of offers of assisted relocation, guaranteed work, loans with easy payment terms, and joining a community of supportive individuals. A quick determination of the sincerity of such offers can be done by gauging the longevity of the organization. How long have they been in business? If new, why have they not formed earlier when human suffering is not new? Organizations offering self-help, where those in need are empowered with no strings attached, are relatively safe. Organizations which would put the individual or family in a potentially stranded situation are highly suspect. ZetaTalk Warning 2/15/2001: In countries where social services exist, those desperate for a rescue will begin to assume that the government will act, perhaps at the last minute but in time to rescue them. Announcements will be made to peacefully evacuate cities and coastlines, tents will be erected, and the populace resettled after it is all over with the worst of it the beans and rice endlessly served for supper. The military, politicians, and those holding stakes in the cities and coastlines being deserted will put selfish interests aside and become humanitarians, in the end. For those clinging to this hope for rescue, we would only point out that the governments today do not act in this manner, but leave many starving children and injustices in their wake, daily. Stressful times will not create heroes, it will create slamming doors. Simply stated, if any are looking to the governments to rescue them, and move close to government operations in the hopes this will occur, they will not only be disappointed, they will become slaves or worse at the hands of those determined to remain in control during the Aftertime.